Univ of Oklahoma Pr, August 1977. Trade Paperback. Used - Good. University of Oklahoma Press, 1977-09-15. Third Printing. Paperback. Like New. A beautiful copy. Owners name on flyleaf. Text in mint/unmarked condition. Cover has minor shelf rubbings. Binding is tight. Your Satisfaction Guaranteed. We ship daily. Expedited shipping available. University of Oklahoma Press. Good+. 1977. Paperback. 0806114282 . 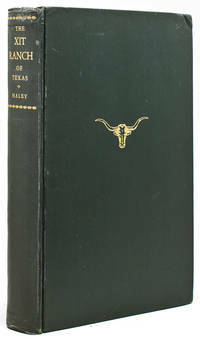 Western Frontier Library; 0.67 x 7.54 x 4.92 Inches; 272 pages . Univ of Oklahoma Pr, Aug-77. Trade Trade. Used - Like New. Clean text- no markings or dog eared pages. Spine has not been creased. Covers are clean with no scuffs or bends Satisfaction Guaranteed!! University of Oklahoma Press, 1977-08. Paperback. Good. Norman. : University of Oklahoma Press., 1967.. Reprint. . Soft cover. . Fine copy. . Octavo.. Illustrated. Important reference work. . Photograph of OUR copy available upon request. VG. Paperback., stiff wrapper 32 b&w photos, 2 maps Ranching / Texas Univ. of Oklahoma Press Norman 1967 (1985) 5th printing 7 1/2 x 5", xiv, 258 p., ISBN 0806114282. Penned name to p. 3. Light edge stain to bottom of wrapper, text unaffected. Solid copy. Looks unread.